Chatuchak Market, also known as JJ Market, is a unique, all-day experience in Thailand that should not be missed! It’s the world’s best outdoor market! Do you agree? Read, visit and find out more! JJ Market is a popular place for tourists from all over the world. It is huge! Thousands of people visit the market every weekend to fill their suitcases for the trip home. With over eight thousand shops selling everything, you can think of from food, clothing, crafts, furniture and even animals! It is rows and rows of amazing shopping at very good prices. Shouldn’t I have a map? Exploring JJ Market is more than half of the fun. The market is organized in very long narrow rows of stalls with many intersections. The small rows of stalls are broken down the middle by a large walking path where you can find food and drink vendors along with unique sights, sounds, smells and tastes. You may think you want to use a map on your phone or plan your route before you come, but that’s not a good idea. Row by row browsing of the market would take DAYS (really) and you won’t get to see half of the market! Wandering through Chatuchak, a quick turn to look at some interesting crafts can get you lost in a maze of other people and shops. It’s better to just explore and just go where your heart takes you! Chatuchak Market Main Walkway, a lot of people! In Thailand, the best shops get popular through word of mouth. Thais will learn about them from friends and family as a result a store becomes well known and other vendors will start to sell similar things right next door to compete for business. Two stores bring even more people, which then bring even more vendors. Soon that area is full of shops all selling one kind of good. This style of competition has created special “zones” in the market that make finding what you’re looking for much easier. Do not forget to wear comfortable shoes and bring sunscreen! As you wander through Chatuchak, you will go through many sections where every shop is going to be selling the same kinds of things. If you’re looking to buy something specific, just walk on one of the big roads until you see stuff similar to what you want to buy. Once you are in the right area, just leave the path and go into the smaller rows of shops where you can find exactly what you want. It’s rows and rows of shopping!! What kind of stuff can I buy? 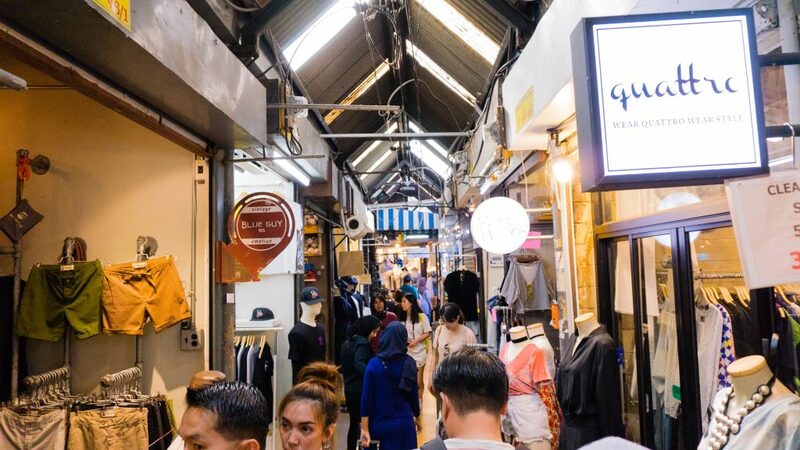 Chatuchak is a shopping paradise for locals and visitors. With vendors selling all kinds of items including clothes, shoes, artisanal soaps, essential oils, wood crafts, ceramic goods, jewelry, furniture, and even antiques. Many shops sell things that are not expensive and you can find craftsmen selling beautiful handmade items too. Handmade crafts in Thailand are really low priced by foreign standards and are perfect as souvenirs and gifts for friends back home. I love the hand-carved wooden elephants, beautiful Thai art and, of course, the clothes! JJ Market is the absolutely perfect way to spend a Saturday or Sunday! Don’t forget the first two rules of visiting a market in Thailand: try to get a lower price for every purchase and always have fun! 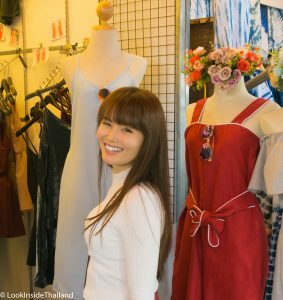 A big smile on your face, being friendly, and laughing with shopkeepers can help to make bargaining easier and a lot more fun. 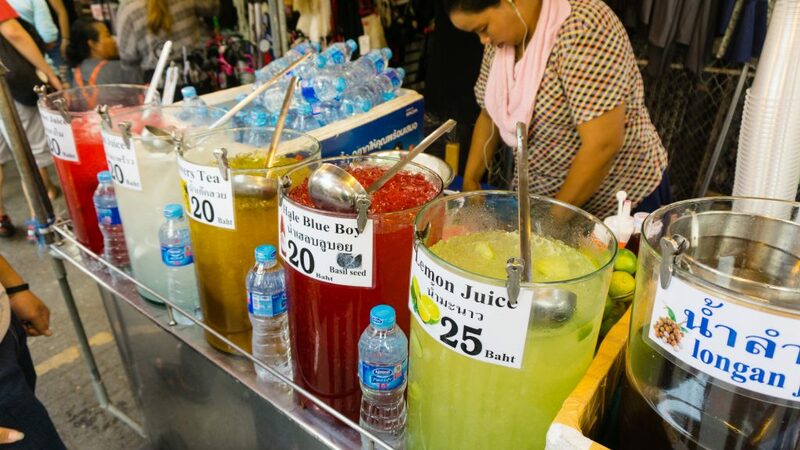 The best way to bargain with a vendor is to smile and ask, “Can you lower the price?” Thai trading culture is all about bargaining and this question will usually get you a discount of at least 10%. If the vendor won’t lower the price, don’t worry and don’t get upset. Politely, say “thank you”, and go to the next shop. Because there will be other stores selling similar stuff and maybe they will be more open to a discount. Buying more than one item from a vendor should always get you a discount. Why is everyone watching the Spanish man? There are many things in Chatuchak Market that are perfect for just looking at. 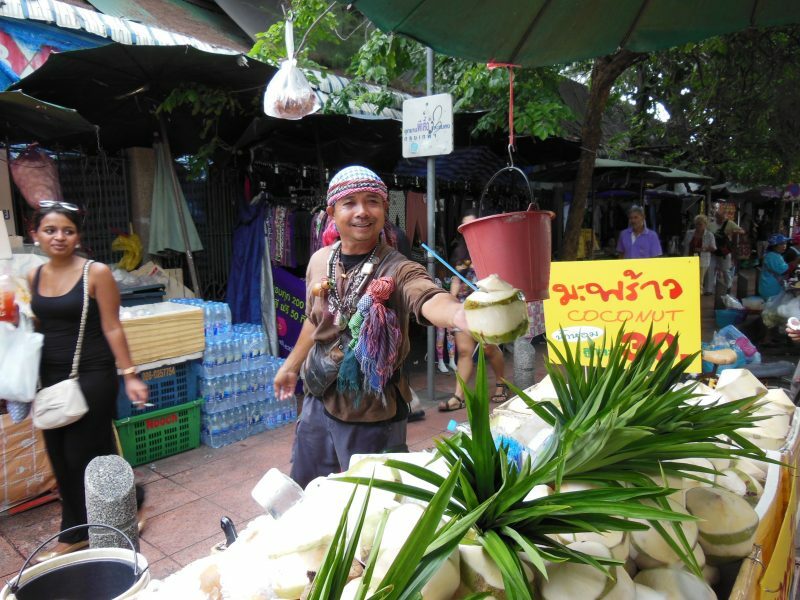 When you come to the market from the Mo Chit BTS station and follow the people along the sidewalk, you need to watch for a popular vendor, the Coconut Warrior. Famous for chopping coconuts with a machete while shouting his unique battle cry, a fresh coconut is how I start every adventure into JJ Market. The little show and delicious coconut will cost 40 baht. Don’t forget to ask for a picture! Along the main walkway in the center of the market is a very large Spanish man who dresses in a chef outfit and cooks delicious paella to loud dance music. His happiness and love of life are infectious and the crowds love to watch him work and taste his food. You will notice many people gathering near the restaurant as it is always busy with people watching and eating. 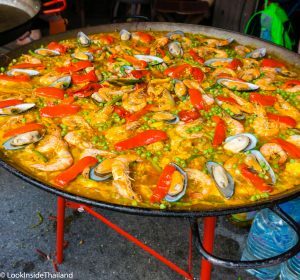 Both Paella Man and Coconut Warrior have become celebrities around the world thanks to the tourists who love them and what they do. If you love animals like I do, you have to go visit Chatuchak Market’s famous pet area! On the north side of the market, there is a giant selection of cute and not-so-cute pets to look at. I like to go and see all the cats, bunnies, squirrels, dogs and even mini potbelly pigs. You can also see scary snakes or creepy lizards, and the aquarium shops carry beautiful fish, crabs, stingrays and even a few exotic animals. The pet area is really large and can take more than an hour to walk through. Even though you can’t bring these cute animals home, you can buy a gift for your pet back home. I always do for my cat, Milo. What is the best time to shop? Come to Chatuchak early in the morning to avoid the heat. because it is easy to spend eight to ten hours in the market and the afternoon sun can be very hot. Most rows are covered, but it can be humid and the main walkways get really hot! I always like to buy a cold drink on the main walkway to cool off. Fresh orange juice, sweet coconut water, or chrysanthemum tea can be found all around the market. Make sure to try the fresh Thai-style coconut ice cream too. It is very delicious and my #1 favorite! You can find it in just about any corner of the market and is tasty both by itself or with the traditional Thai toppings. Try it with “everything”! Get the coconut ice cream with red beans and sticky rice! Aroi! I need a break. Where can I go? When you exit the Mo Chit BTS station, you will find the beautiful Chatuchak Park. This wonderful park has a big lake, large open grass areas, and beautiful old trees to rest under. Other parks like Wachirabenchatat Park or Queen Sirikit Park are also just a short walk away. Buy a ten baht bag of peanuts and you’re sure to make a new friend. The friendly squirrels love to eat them, even from your hand! Peanuts are their favorite and feeding them is always fun. If your feet are really hurting, I recommend a Thai foot massage! You can find them in and around the market, but my favorite place is in JJ Mall. On the north-west corner of the market, this indoor mall has even more stores and also has lots of massage shops with air conditioning on the bottom floor. There are shops offering excellent Thai body and foot massages for a very good price. 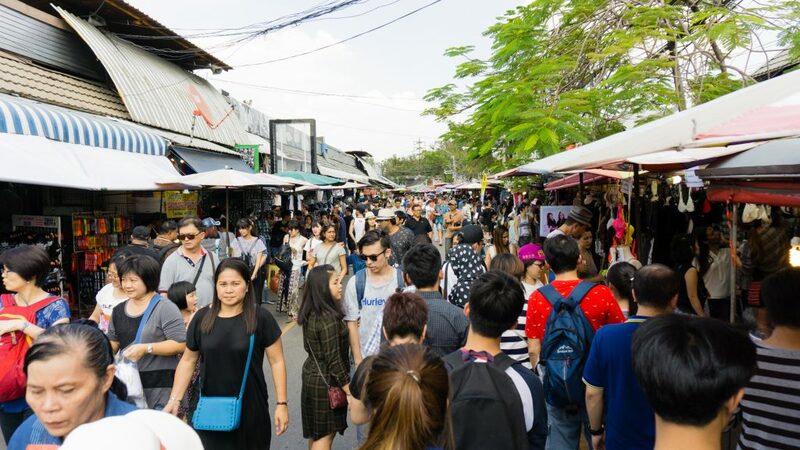 Walking around Chatuchak Market can get really tiring, but after an hour or two of getting your feet rubbed while sitting on a comfy chair, you will be ready to go back out for some more shopping! I am always hungry after a few hours in JJ Market! This place has so much delicious food and snacks to eat, so choosing can be hard. There are a couple large food areas in different parts of the market and noodle shops can be seen everywhere off the main walkways. 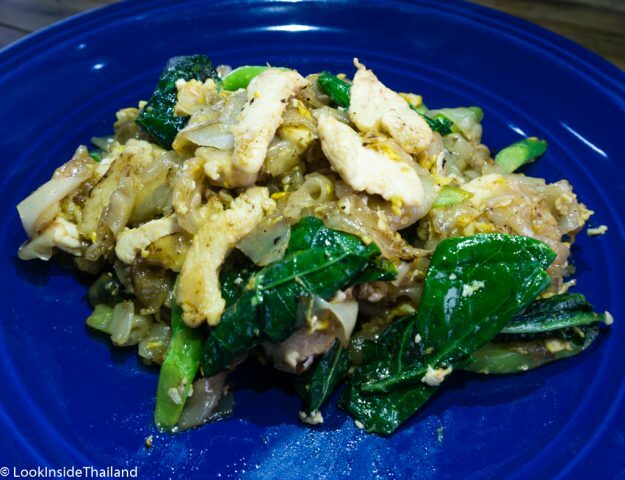 Check out a few of the delicious Thai dishes that can be found in the market! Are you an expert explorer? If you are hungry and want to eat where the locals go, there is a boat noodle soup shop that is one of my favorite places to eat at the market. Deep in Chatuchak Market, there’s no guarantee you’ll find it, but the food is worth it if you do. Rumored to be the best boat noodle soup in Thailand, it is a popular stop for shoppers and even Thai celebrities! 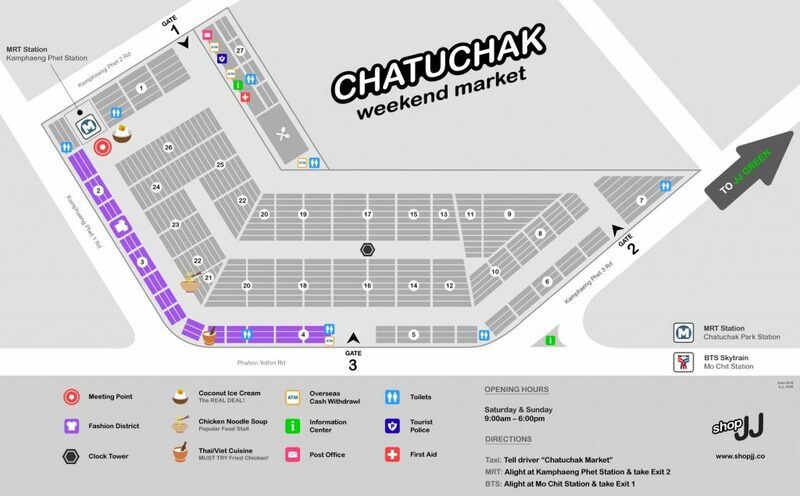 Chatuchak Market is open Saturday and Sunday starting at 7:00am until 6:00pm get there early! Located on the north end of the city and easy to reach by the MRT subway and the BTS SkyTrain. MRT Subway: Take the MRT Subway on the Blue Line to the Chatuchak Market station. TAXI: Remember to always make sure the taxi driver turns on the meter. 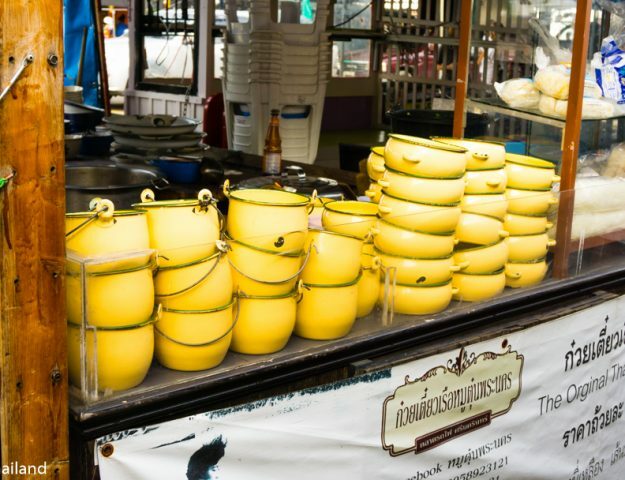 Finally, with all the shopping and food to experience at Chatuchak Market, and in Thailand, what are you waiting for? Get online, find a good deal on a ticket and get going making your own adventures! Tip 1: Near closing time, the vendors bring items into the main aisles to sell at deep discounts. Tip 2: International shipping companies in the market can pack and ship your items back to your home country. Even large pieces of furniture and art can be sent! Tip 3: Watch out for pickpockets. Make sure to have a purse or bag that zips up. Tip 4: Bathrooms cost three to five baht. Most of all don’t forget to buy toilet paper at the table before you go in. Check out my travel PDF’s available in our store to get more insider travel tips and tricks with a detailed breakdown of the JJ Market area. It includes my favorite street food, traditional massage shops as well as my favorite shipping vendors. 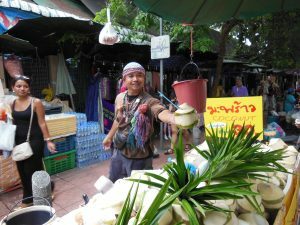 “Fon’s Insider’s Guide to Chatuchak Market Area”. Want a private tour? Contact us to setup your insider’s tour and if you’re lucky, you may even get me as your guide. I hope to see you soon in Thailand.